BOOM! Studios and Nickelodeon are excited to announce ROCKO’S MODERN LIFE, a new ongoing comic book series based on the popular animated show about everyone’s favorite wallaby! Writer Ryan Ferrier (Regular Show, Mighty Morphin Power Rangers) and artist Ian McGinty (Adventure Time, Bravest Warriors) team to launch the first comic book in the series in December 2017. Each issue will also feature bonus short stories by different illustrators, including Tony Millionaire (Sock Monkey), KC Green (Invader Zim), and David DeGrand (SpongeBob Comics). Rocko, Spunky, Heffer, Filburt, the Bigheads, and the entire cast of O-Town are back, but all is not well. The town is facing a job shortage and Rocko is hit hard. With unemployment and potential homelessness on the horizon, Rocko’s problems are just beginning. But with help from his best friends Heffer and Filbert and his faithful dog Spunky, Rocko is (mostly) ready to take on the world (maybe). ROCKO’S MODERN LIFE marks the second series in the partnership between BOOM! Studios and Nickelodeon through BOOM Studios’ award-winning, all-ages imprint, KaBOOM!. The first series of this partnership debuts October 18 withRugrats #1, from writer Box Brown (André the Giant: Life and Legend) and artist Lisa DuBois (Adventure Time). 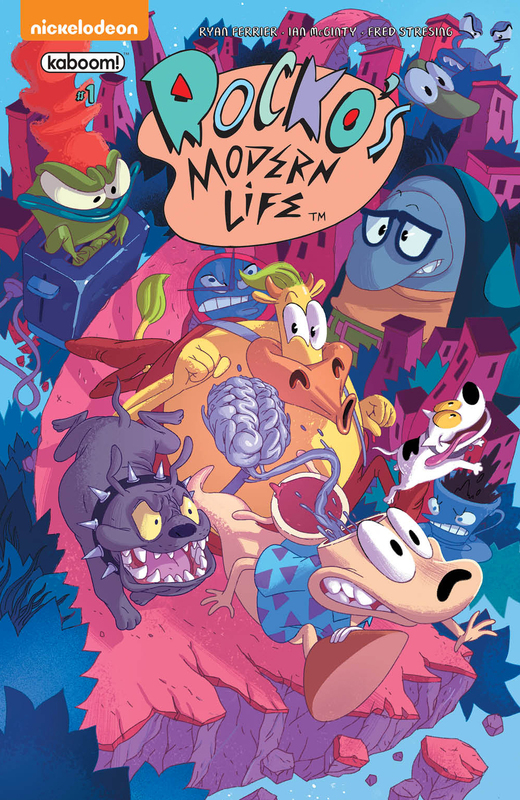 ROCKO’S MODERN LIFE #1 features a main cover by Jorge Monlongo (Adventure Time Comics), a “look-and-find” cover by Bachan (Bill & Ted Save the Universe), and a variant cover by Nick Pitarra (The Manhattan Projects). BOOM! Studios will also be offering a blank Sketch Cover for this launch. Print copies of ROCKO’S MODERN LIFE #1 will be available for sale in December at local comic book shops (use comicshoplocator.com to find the nearest one) or through the BOOM! Studios webstore. Digital copies can be purchased from content providers, including comiXology, iBooks, Google Play, and the BOOM! Studios app. ROCKO’S MODERN LIFE is the latest release from BOOM! Studios’ critically acclaimed KaBOOM! imprint, publisher of world-class licensed series such asSteven Universe, Over the Garden Wall, Peanuts, and Garfield, along with original series like Brave Chef Brianna by Sam Sykes and Selina Espiritu, and The Deep by Tom Taylor and James Brouwer. For breaking news on ROCKO’S MODERN LIFE and more from BOOM! Studios, stay tuned to www.boom-studios.com and follow @boomstudios on Twitter.